More about this property: Log Cabin located in woodland, 5 minutes drive from Ambleside and Lake Windermere. Free access to on site swimming pool (leisure facilities open from Easter to November). More about this property: Homely stone-built sleeps 6 holiday cottage with 4 bedrooms and a comfortable interior, great location for a walking holiday with a location around mid-way between the North Pennines AONB and the Lake District National Park. More about this property: Stylish and beautifully furnished 3 bedroom rural retreat, set within the North Pennines Area of Outstanding Natural Beauty. This dog-friendly holiday house is just lovely and is a short drive from Hadrian Wall's Country and Northumberland National Park. More about this property: Magnificent 5 bedroom large Georgian holiday house with spacious rooms and ample character, ideal for big families or groups of friends, set in around an acre of beautiful gardens by the Lake District National Park. More about this property: Beautifully presented 3 bedroom, 2 bathroom Lakeland holiday cottage sleeping up to 6 people, set within Ambleside close to the heart of the Lake District National Park. More about this property: This pretty, fully renovated sleeps 4 cottage provides all the necessary components for an exciting family-friendly holiday, the charming exterior leads to a pleasant garden, perfect for relaxing with your loved ones! Stone built and only three miles from the famous market town of Ulverston, family fun in the Lake District awaits! 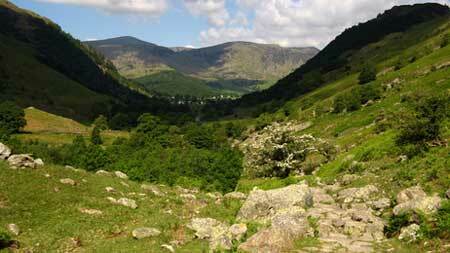 These holiday cottages are all in the beautiful Lake District in the north west of England. Please click on the photographs to see the details of each holiday cottage and where it is located within the 800 sq miles of the Lake District.